Aveam niste urda. Eram la casa noastra de vacanta de la Carbunesti (adica, la tara :)). Se facusera in gradina si coacazele rosii, si zmeura si capsunele. Rezultatul? Aceasta prajiturica cremoasa, cu urda si fructe (de gradina, ca doar erau din gradina noastra)! Prajiturica este vintage nu pentru ca asa are ea, un aer de prajiturica cremoasa, usurica, din copilaria mea. Sau nu doar de aceea. Ci mai ales pentru ca este facuta intr-o atmosfera de anii ’60-’70. Adica… Mai intai, se ia un mixer adus de bunica paterna din SUA, prin anii ’70, care merge doar cu transformator. Apoi, se scot la lumina tava de chec si sita de faina… care au o patina a timpului (si oricat ai freca la ele , nu se duce, si ar fi si mare pacat – ca doar sunt vintage, nu?). Si cel mai important, tavile de chec sunt facute de bunicul (matern, de data aceasta), acum… cam vreo 50 de ani? Au doar dimensiuni neobisnuite (adica non-standard), dar cate chec-uri neobisnuite am mai mancat si mama, si eu, si Radu si nu ne-am plans. Cuptorul, nu stiu din ce an e, dar tot de pe atunci, nu are geam, nu are gradatie de temperatura (si daca ar avea, oricum nu se mai vede nimic) e mic rau, dar perfect pentru tavitele de chec mici-mici. Prajiturica iese si fara toate astea, dar nu garantez ca are acelasi farmec :). Reteta preluata de aici. 5. se pune cu lingura in forma si apoi se niveleaza. Prajiturica merge intr-o forma standard de chec, eu am pus-o in formele mele mici-mici si a intrat in doua. Data viitoare insa o voi face intr-o tava de 20/20 sau 20/30, ca sa iasa blatul subtire si multe fructe deasupra. 6. se taie si se aseaza frumos fructele deasupra. 8. se pudreaza cu zahar pudra cand este inca calduta. I had some country-style ricotta. I was on holiday at our vacation house in Carbunesti (ie, the countryside). 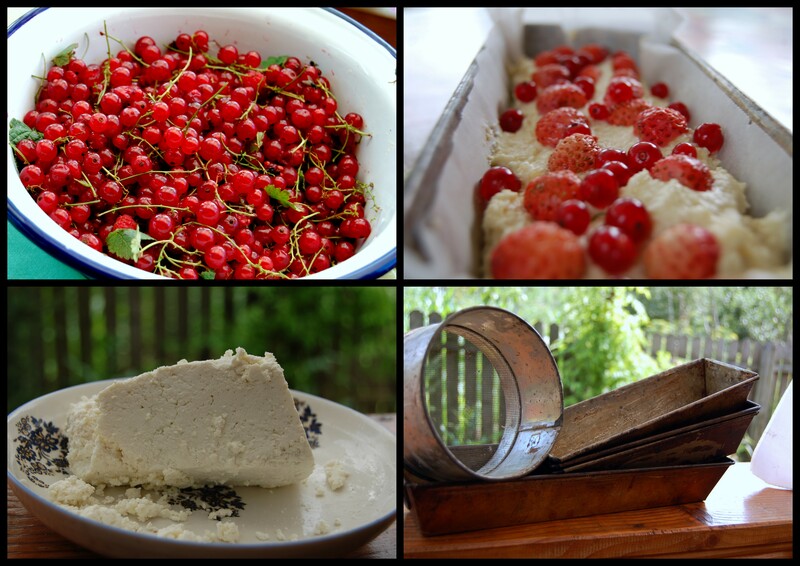 The red currants, raspberries and strawberries were ripe in the garden. The result? This creamy cake with cheese and fruits (from our garden)! 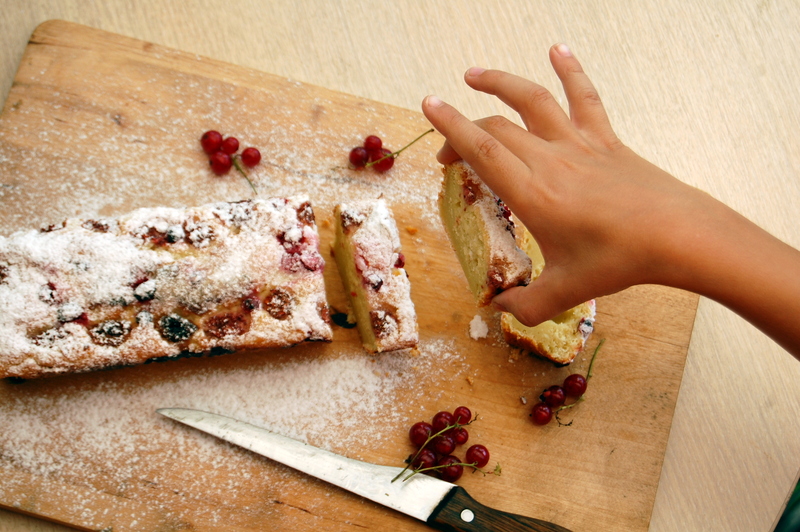 This is a vintage cake not because it is a creamy cake, light and fruity, reminding me of my childhood. Or not just so. But especially because it is made in an atmosphere of the 60s and 70s. First,you take a mixer that the paternal grandmother brought back from the U.S. in the early ’70s, which works only with a plug adaptor. Then you take out the cake pan and flour sieve … with a patina of time (and no matter how long you scrub them, they will not look shinier, and wouldn’t it be a shame? – they simply are vintage!). And most importantly, the cake pans are made by my grandfather (maternal, this time), … about 50 years ago? They are unusual in size (ie non-standard), but how many such unusual cakes have I eaten in time… or my mother… or Radu?. The oven, I do not know what year it was made in, but it must date around the same 60s. No glass, no gradations of temperature (and if they were, you can no longer see anything it was written on it, anyway), extremely small, but perfect for my small-small cake pans. The cake can be made without all this, but I cannot guarantee it will be just as charming. 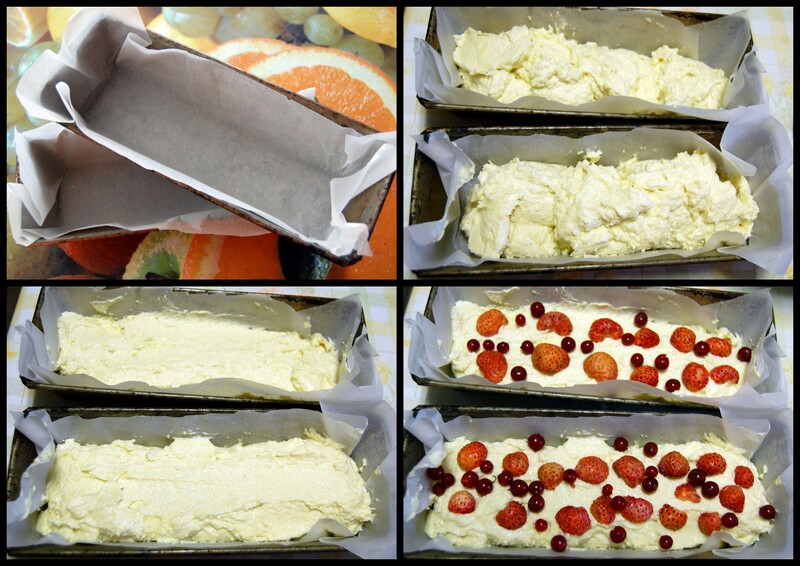 5. spoon the dough into cake pans and then level. The cake fits into a standard pan for loaf sponge cake, I have put mine in my small-small vintage pans, and it fitted two of them. But next time I will make it in a tray of 20/20 (cm) or 20/30 (cm), to spread the dough out thin and have plenty of fruits on top. 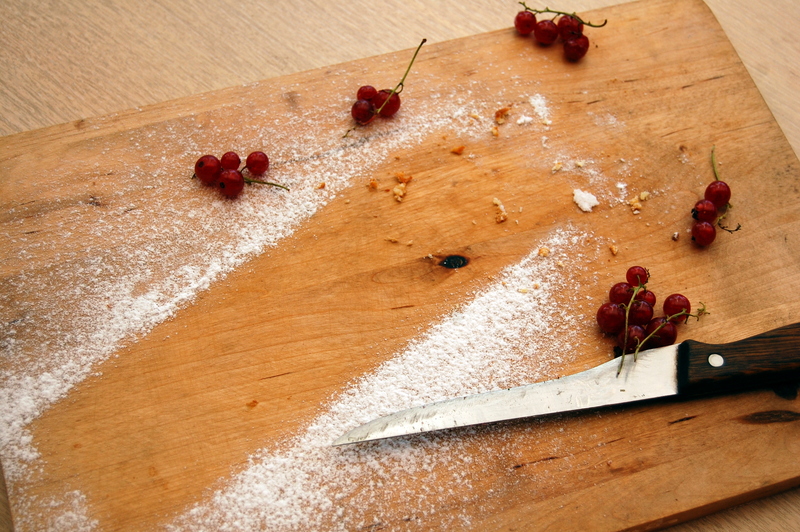 6. cut and spread the fruits on top. 7. bake at 180 degrees C for 40 min (in my forms it was done in 35 minutes) until a toothpick inserted in the middle comes out straight. 8. powder with icing sugar while still warm. I love ricotta in baked goods. This is sounds delicious! It is very good, indeed! Thank you! Is the ricotta low moisture as in strain the ricotta over a sieve weighted in the refrigerator over night? Recipe looks great! it is a local product similar to ricotta, but definitely a low moisture cheese (as you can see in the pic, it comes in “block”, but is very crumbly and soft); so if your product contains more water, straining is definitely recommendable.